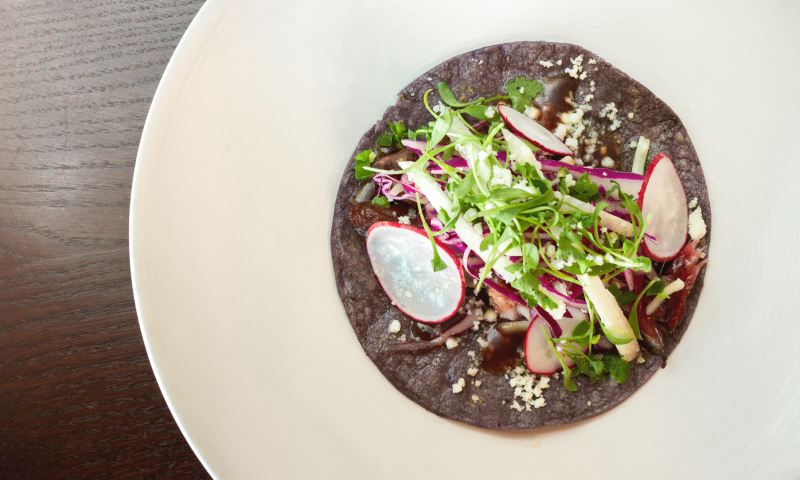 From hog jowl tacos ($18) to bison burgers, Black Sheep at Epic Brewing Sugarhouse has all the contemporary Southwestern and Native American–inspired fixings you’ll need to pair with your brews. Photo: Talyn Sherer. Baa, Baa, Black Sheep: Show Me Your Pig! Friday–Saturday: 11:30 a.m.–3:30 p.., 5 p.m.–11 p.m. Located in the heart of Sugarhouse is a contemporary brewpub inspired by Utah’s intrinsic history. Black Sheep has taken over the dining space at Epic Brewing, offering a menu that surprises with authentic Native American cuisine. The made-to-order spread is a fusion of Southwestern, Navajo and Mexican-inspired dishes. When I think of a brew pub, I don’t typically associate it with intimate low lighting, Edison bulbs and hog jowl tacos. The space brings back memories of hotspots in foodie towns such as Charleston, South Carolina; Mérida Mexico; and Asheville, North Carolina. It has a good feel and a great selection of hops on draft, which is becoming quite important the more I explore craft brews. As an homage to local, authentic cuisine, I give Black Sheep props for bringing a fresh taste to Salt Lake City. The tacos are something to write home about and are the absolute must-try on the menu. Hog jowl is cured and smoked cheeks of pork. Even though it is quite common in the South, the hog jowl is also known as soul food in Native American and Mexican cuisine. The cheeks of the pig are extremely flavorful and tender, as though the protein could melt in your mouth. A pig is symbolic of abundance, fertility and agriculture in many Native American cultures, while a sheep pays tribute to the good life. Perhaps the restaurant’s identity and brand name is a play on words from past and present Utah culture. Sheep Burger. Photo: Talyn Sherer. Braised Pork Enchilada ($20). Photo: Talyn Sherer. Carrot Cake. Photo: Talyn Sherer. As any standard pub would have, burgers grace the menu. Options: Goat. Sheep. Bleu. It is a simple menu, which is what I like. But wait—you are not actually eating a goat or a sheep. The protein is bison (which I love). I don’t know how the Sheep Burger, topped with fire-roasted Anaheim chile, got its name. However, “bleu” makes sense: bleu cheese and bacon, and the owner of Black Sheep—Bleu Adams. 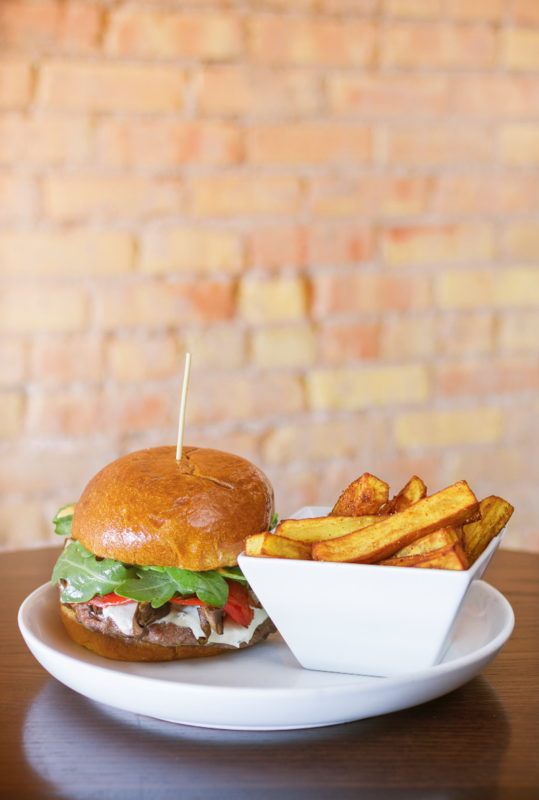 As a lover of goat cheese, I had to try the Goat Burger: a combination of bison, portobello, garlic-herb goat cheese, roasted red bell, arugula and chipotle mayo—with a side of fries, of course! At first bite, it was a bit of pepper overload. However, the tastes blended together nicely as I finished the bite. The burger menu is great and perfect for a brew pub. My waiter recommended the Bleu Burger, so I will be back to try it, too. I have this thing when I try food. I insert my fork into my mouth, and then it begins. As I take a perfect bite of each dish (in this case, the burger, enchiladas and tacos), I make sure to capture all ingredients on my fork, and then allow the slow, soft chewing to embrace every flavor while I close my eyes and cover my ears. My hope is that I put my hearing and sight to sleep to better focus on my tastebuds. I am sure that I look funny (there are photos out there), but it really does help with the discovery and exploration of a chef’s creations. Now, imagine me cutting a bite that includes every staple of the Braised Pork Enchilada ($20), placing the fork in my mouth, closing my eyes and covering my ears as though a young child is screaming. Insert laugh here, but it really allowed me to experience the Mexican fusion of red chile sauce and queso fresco with a hint of cilantro lime rice and red bell pepper, embraced by blue corn tortillas. 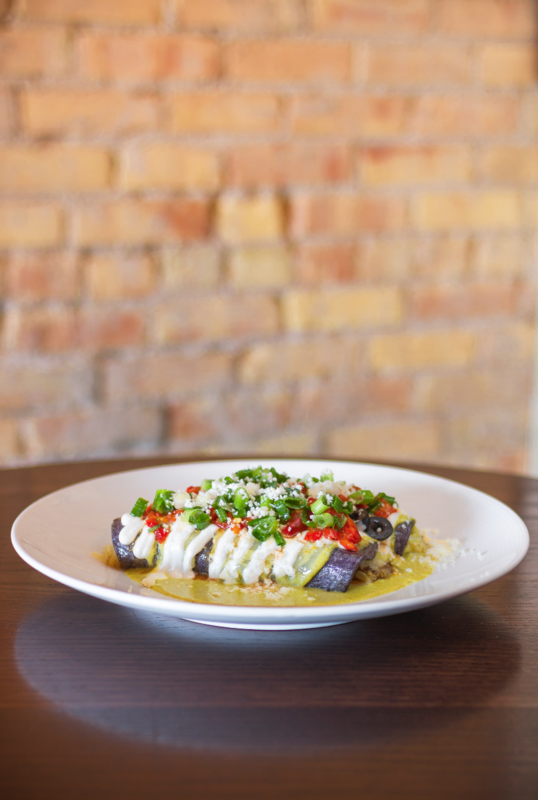 The enchiladas will leave you wanting to lick the plate. Wait—there is an important flavor I have missed. Hops. My selection of Epic Brewing’s Hoppyland paired nicely with each of these entrées. Epic’s selection is some of the finest. I prefer IPAs, which provide a little hop that serves as a refresher to the culinary spice. OK, now dessert. Sugar! 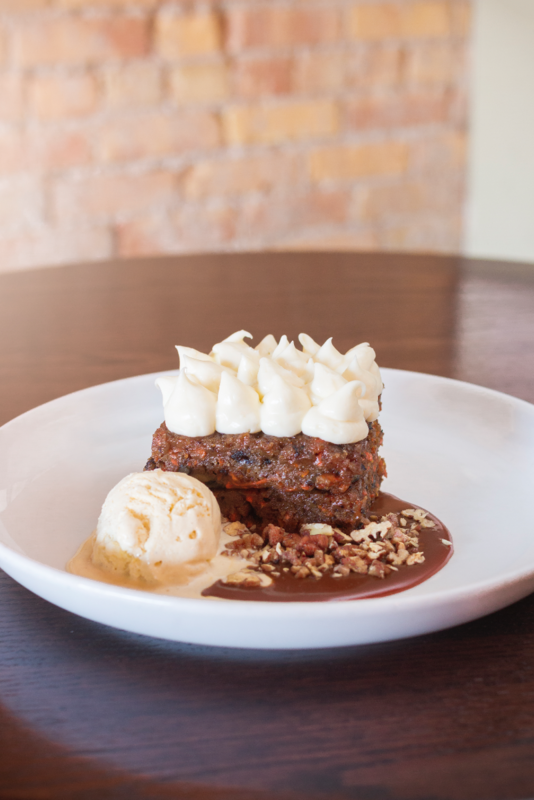 Or, can we say, the yummy goodness of carrot cake. This was not your typical bakery slice. Served warm and damp, it had the texture of bread pudding. It could have had a little more spice to it—yet, perhaps it was the black sheep of the meal, and perfect as it was served. Overall, Black Sheep is a great spot to meet friends or have a low-key night out. I wouldn’t call it the place to swoon someone, yet it does offer a certain ambience if you want to have an easy date night. 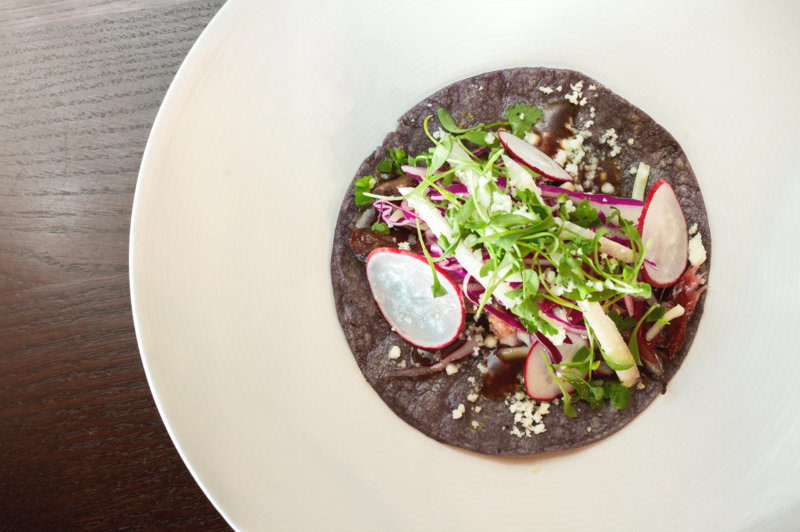 You thought you knew brewpub fare, but wait until you try Black Sheep’s Native American–inspired tacos. In case you have not figured it out, I recommend the tacos.